PeoPo Citizen Journalism Platform is an open Internet platform encouraging citizens to register as users and report on public issues. Platform users are not PTS employees. The behavior of users while newsgathering is the sole responsibility of users and does not represent PeoPo Citizen Journalism Platform or PTS. Platform users are forbidden from calling themselves “PeoPo journalists” or “PTS journalists”, or using business cards with the aforementioned status. Users must report fairly and honestly on content related to public issues. Users must avoid personal gain from reporting, and not exaggerate or distort the facts to benefit oneself or any affiliated organization. Users must disclose the sources of all reports and in the event of litigation over plagiarism or intellectual property right violation the user will personally assume all legal responsibility. Should the user be unable to verify the reliability of a source, any misgivings in relation to the story must be clearly indicated. When choosing headlines, users should avoid oversimplification or exaggeration that could mislead the audience. Users should listen to all opinions while newsgathering and use only facts in reports. Except in cases of public interest, users shall respect the privacy of subjects and, even where public interest comes into play, should avoid disturbing the victims of unfortunate circumstances. Users are forbidden from directly posting event brochures onto the platform. Events related to non-governmental organizations or nonprofit organizations should be presented in the form of a report and related event brochures attached as a link. Report content must be related to public issues. Content and headlines must not be used to habitually publicize individuals, organizations or certain issues. Commercial publicity, commercial website links, and commercial contact numbers are strictly forbidden from reports. 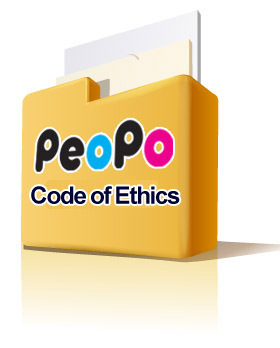 PeoPo Citizen Journalism Platform encourages original reporting. Reports should not use, reproduce or edit unauthorized text, photographs, images, or music. While newsgathering, taking photographs or shooting video, users should not place themselves or others in jeopardy, take unnecessary risks or violate any laws. Users are required to promptly admit and correct reports containing errors and are responsible for overseeing and correcting unfair news reports or misleading sources.